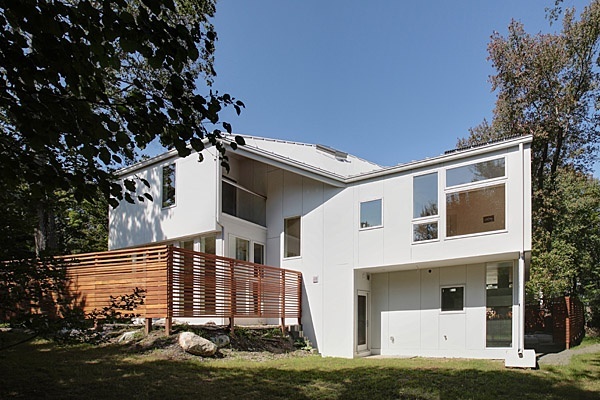 In many older suburbs, the typical pattern of construction is to replace an existing house with a much larger one built out to the legal setbacks. 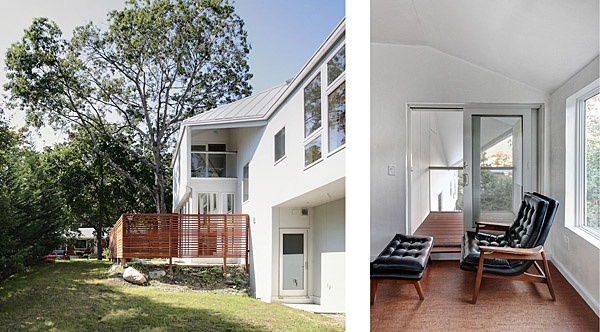 The Braver House is a prototypical alternative: To instead build a small, efficient residence that simultaneously minimizes its actual footprint, while maximizing its perceived sense of interior space. This is achieved through two methods: By expanding a diaphanous screen to the setback line expanding the territory of the interior to the exterior, and by shifting the plan and section to capture elongated views from inside to outside. By claiming the under utilized lawn of the typical suburban yard and replacing it with permeable hardscape, potable water use is drastically reduced. 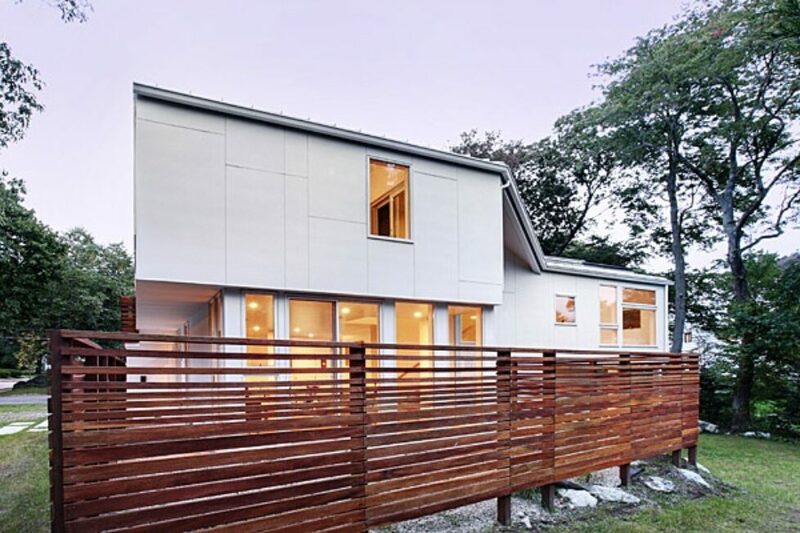 In terms of minimizing energy use, the diminutive size of the house is coupled with a completely passive cooling system, a solar powered radiant heated floor and super insulated walls and roof. Minimum Footprint / Maximum Permeability In older suburbs where landcost has multiplied, new rebuilds are typically built out to the legal setback line. 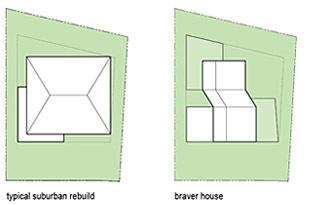 The Braver House proposes a new minimum footprint solution where the sense of space is expanded by instead building a screen out to the setback line. 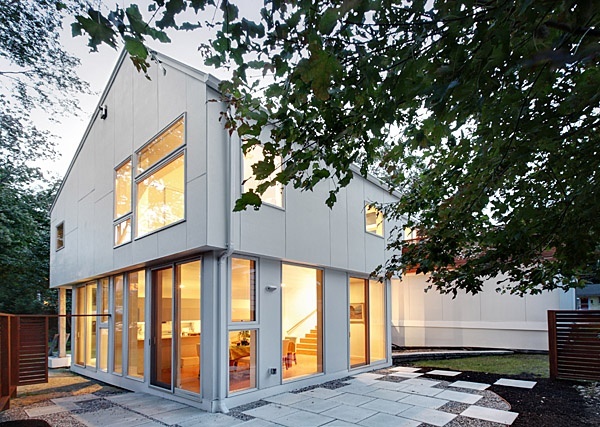 If deployed as a prototype, a series of Braver Houses could increase the permeability of a catchment area decreasing the burden on municipal systems. Meanwhile energy use would be drastically reduced due to the smaller size. Interior spaces are overlapped with the exterior: the wooden screen becomes a middle ground that defines expanded boundaries. 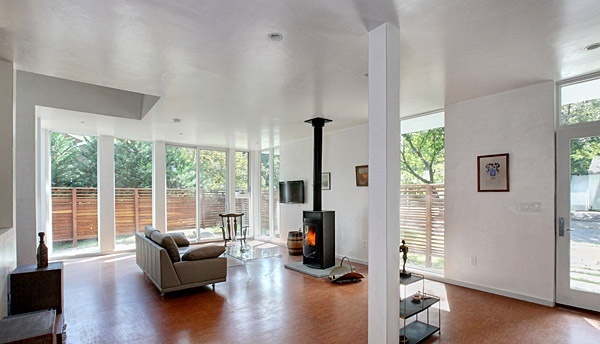 In the living area (top), a high efficiency, low-emission wood burning stove supplements the solar powered radiant floor heating system. Its proximity to the passive stack directly opposite from it allows heat to be drawn into the upper floors of the house. 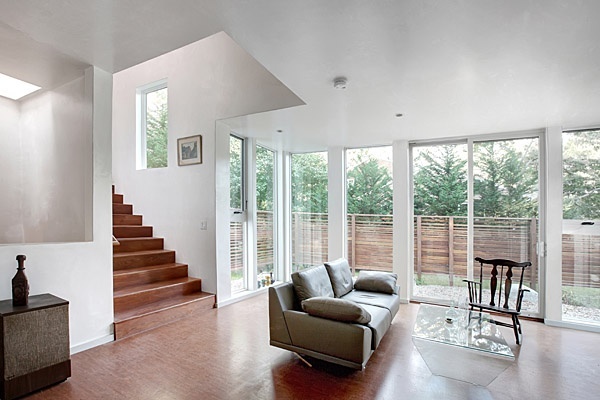 A renewable cork floor is used throughout the house. 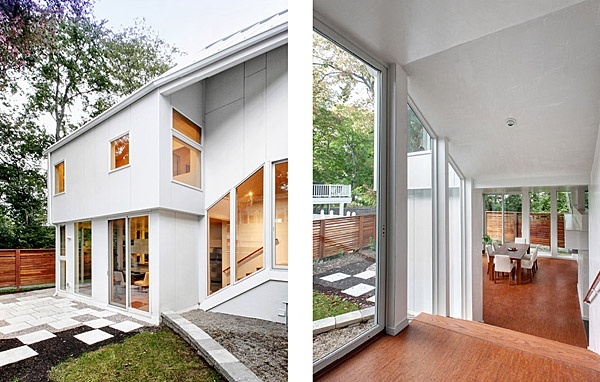 Its color is matched with the exterior screen to create visual and spatial continuity. 1st Floor Plan: Each interior space has a reciprocal exterior space – for instance the living and dining areas have their counterpart directly opposite a set of floor to ceiling windows so that the landscape screen becomes the the ‘outside’ rather than the envelope of the house. View of sideyard: The openness of the ground floor is screened from neighbors while cantilevered 2nd floor areas provide shading for the ground floor. The strategically asymmetrical pitch of the roof conceals an array of solar panels while maximizing their solar exposure. 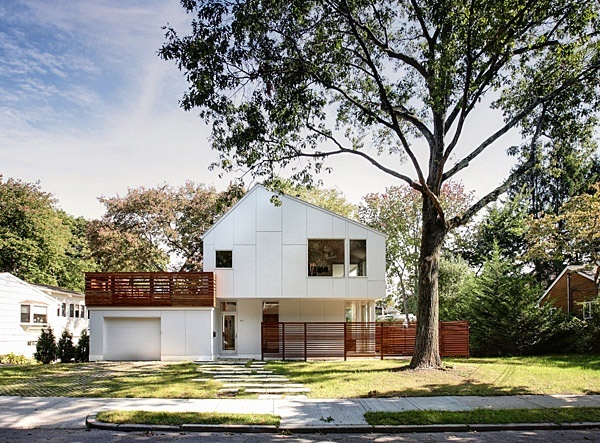 Beginning with the existing site slope, the house is shifted in both plan and section: Although the rooms are small, oblique views expand the sense of space. 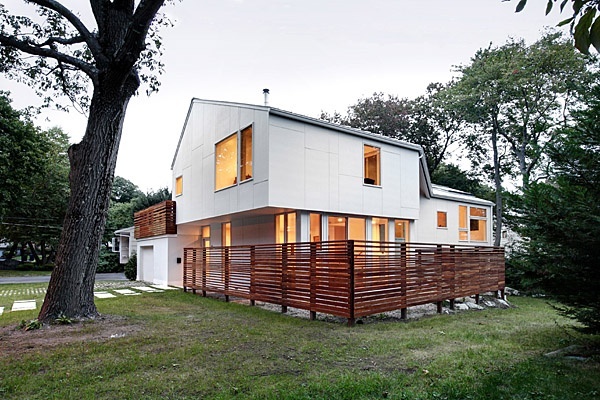 Instead of foreshortened frontal views, the shift in plan extends views obliquely through the sideyard. 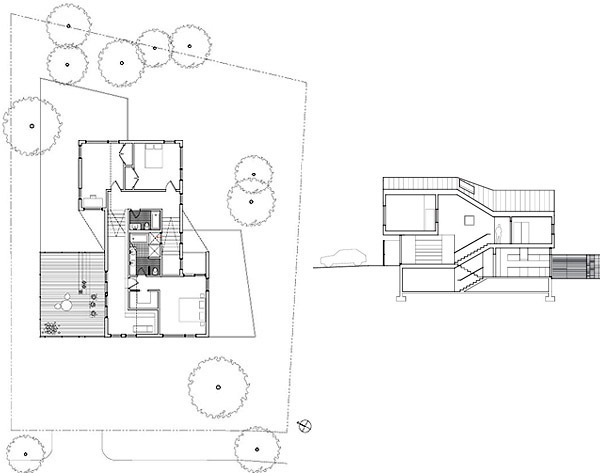 The shift in plan and section extends views through the public areas of the house and to the yard beyond. 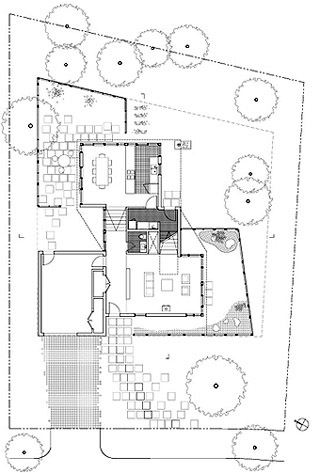 Second Floor Plan (left): The spaces are organized around a vertical ventilation and plumbing core. 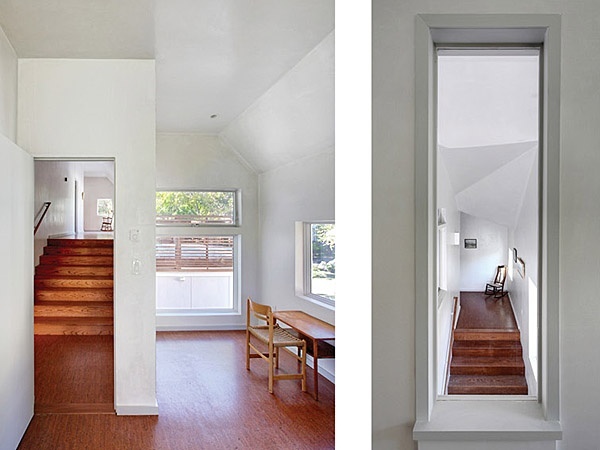 The gently sloping stair (right) creates a vertical continuity between the elements of the house. The combination of the screens and overall massing allow the project to read not as a single structure, but as a pair of smaller pavilions with landscape in between. Replacing the yard within the screens with permeable hardscape drastically reduces the use of potable water while maintaining the decreased area of grass outside the screen allows the project to ‘blend in’ with its neighbors.